Bonne année! While in Paris, a foodie’s dream, I encountered the culinary wonders that France has to offer. I love the beautiful chocolates and pastries, and there are many fantastic dishes to explore. One evening, as a first course, I had the most delicious roasted mushrooms, served with a fresh baguette and a glass of red wine. It was simply perfect! I make this version of roasted mushrooms quite often. They are part of a chicken dish, but I make them to go with other meat dishes or just as an easy side dish. Place the mushroom caps down in a single layer or spread the mushroom slices in a small baking dish. Drizzle with the olive oil and vinegar, season with salt and pepper. Add the fresh sprigs and toss to coat. 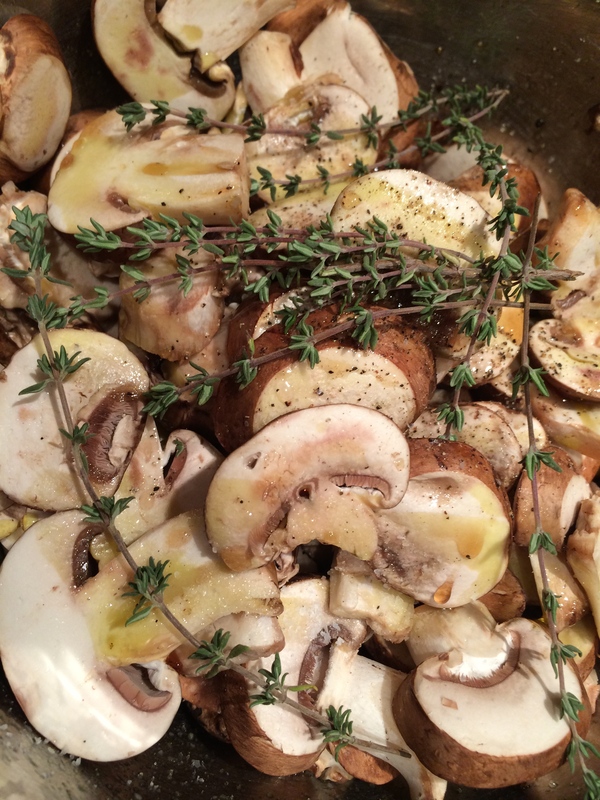 Roast the mushrooms until golden brown, about 20 minutes, stirring several times during cooking so they cook evenly. Serve warm. Wow! Sounds yummy! Thanks, Pam. Happy 2014! Hi Pammie, Now you’re talking directly to me! !…I just love mushrooms and will make this soon. Phil is not a fan but he doesn’t hate them. Didn’t mind the 2 extra days of vacation Th. & Fri. totals to 14 days off. Another storm comes in on Sunday, could be rain or snow? Mushrooms are my favourite thing! I will have to try this! It looks delicious!